This 2,000 sq. ft., 2 bedrooms, 2 1/2 bathroom fully furnished penthouse condo in a five storey high building, is available for seasonal and long term vacation rentals. Located at Island Point in Deerfield Beach, Florida; 50 miles from Miami International, 20 miles from Ft Lauderdale International, 30 miles from Palm Beach International, and 35 minutes to Gulfstream Park; and situated in a quiet area of the beach just south of Deerfield Beach Pier and far enough from the crowds. Deerfield Beach is rated a 'blue wave' beach and is considered #1 in ratings of Florida's beaches! The building provides also fenced landscaped courtyard, and private ocean front pool; Outdoor BBQ Grill; one Parking stall; four Visitors Parking Stalls, and key less entry code as part of the convenient amenities. Spacious Master Bedroom with King size bed, en suite, balcony and full view of the ocean; large second room with Queen size bed and private full bath; large great living, dining and family room, with half bathroom, office desk and sofa sleeper; with dinette area and dinette table off kitchen; and storage closet near entrance. The condo has been fully updated, and tastefully furnished complete with all appliances, Internet, WI Fi, HD Cox Cable TV and Majicjack Plus phone. Enjoy the breathtaking panoramic view from your large private ocean front balcony and the living room windows. 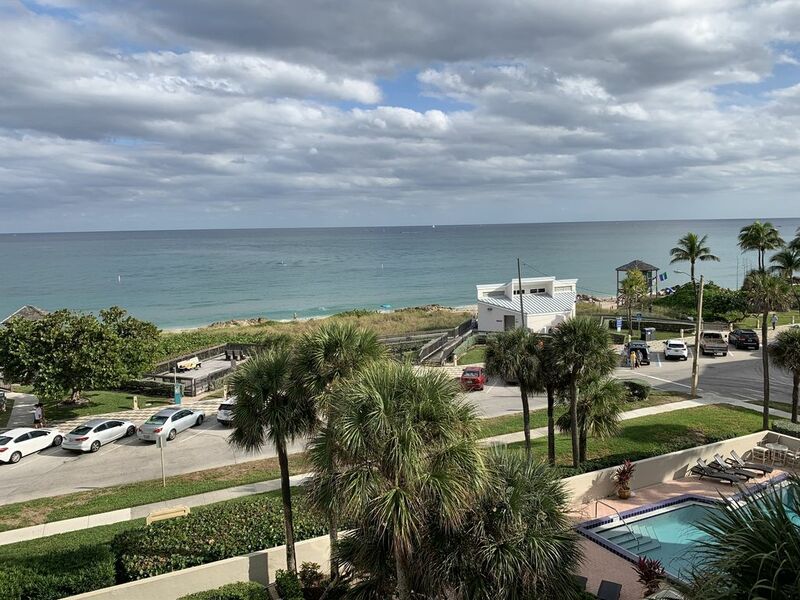 The gorgeous sandy beach of Deerfield Beach, and the paved 1.5 miles walkway along the beach, are just 50 steps away, where relaxation and fun await you as well as the private and fenced landscaped courtyard and ocean front pool. Located a few blocks away from many restaurants, shops and the International Fishing Pier; and free concerts and dancing every Tuesday night. Whether you are looking for relaxation and tranquility or fun in the sun, this is the place for you. With luxurious accommodations and amazing views what more could you ask for? The Unique Benefits at this Condo: Located a few blocks away from many restaurants, shops and the International Fishing Pier; and free concerts and dancing every Tuesday night. Whether you are looking for relaxation and tranquility or fun in the sun, this is the place for you. With luxurious accommodations and amazing views what more could you ask for? No pets or smoking allowed within the condo. Situated in a quiet area of the beach just south of Deerfield Beach Pier and far enough from the crowds. Deerfield Beach is rated a 'blue wave' beach and is considered #1 in ratings of Florida's beaches! The condo is so close to the beach and ocean, shopping stores, golf, yet it’s so private. It's fully equipped for your comfort. The ocean view from the condo makes the ocean part of your living room. Come to enjoy! We came in the Winter and it was just breathtaking to watch the sunrise and sunset, and to swim in the ocean water after having shoveled enough snow for a life time during Winters in Alberta, Canada. The people here are so friendly and so many attractions are available that we plan to get to them all. At night after we've been swimming, sunbathing, reading or just go for a walk. We subsequently began our plans for a retirement condo on the ocean front which we found at Island Point. The beach reminded us of the happy times we spent during our teen years on the sandy beach of the Mediterranean. The condo is so close to the beach and ocean, shopping stores, golf, yet it’s so private. It's fully equipped for your comfort. The ocean view from the condo makes the ocean part of your living room. Come to enjoy! Spacious Master Bedroom with King size bed, en suite, balcony and full view of the ocean; large second room with Queen size bed and private full bath; large great living, dining and family room, with half bathroom, office desk and sofa sleeper; dinette area with dinette table off kitchen; and storage closet near entrance. The condo has been fully updated, and tastefully furnished complete with all appliances, Internet, Wi Fi, HDTV and Majicjack Plus phone. Court yard with Private swimming poor, change rooms and BBQ area. Handicapped Accessible (may have limitations). The gorgeous sandy beach of Deerfield Beach, and the paved 1.5 miles walkway along the beach, are just 50 steps away, where relaxation and fun await you as well as the private and fenced landscaped courtyard and ocean front pool. Located a few blocks away from many restaurants, shops and the International Fishing Pier; and free concerts and dancing every Tuesday night. Whether you are looking for relaxation and tranquility or fun in the sun, this is the place for you. With luxurious accommodations and amazing views what more could you ask for? No pets or smoking allowed within the condo.